A fun new reusable, plastic personal hot cup is now at Starbucks. 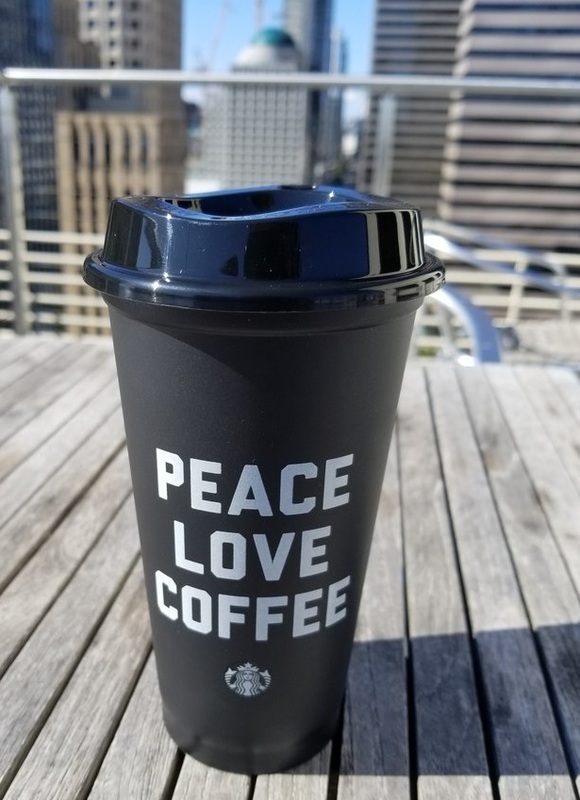 It’s a $2.00 hot cup that is black and says Peace Love Coffee. Very cool looking! 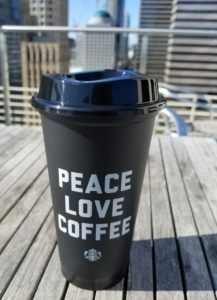 You might recall, it was about 6 years ago that Starbucks introduced this kind of personal cup, and back then they were $1 each. 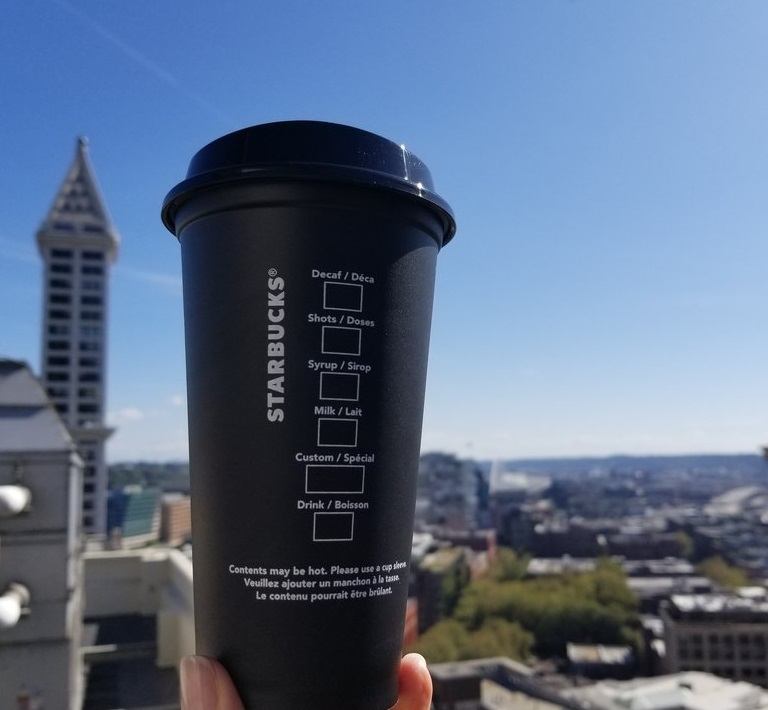 Because they’re a fairly thin plastic, when they were introduced, Starbucks gave us a guideline of about 30 uses per cup (and then toss into the recycle bin!) though I actually think they’ll endure a lot more than 30 uses. Over the years, these personal cups have been offered with a variety of designs, including in 2015 with partner-created artwork on them. Since we’re talking about a reusable cup, now would be a great time to mention how the personal cup discount works. I don’t think I’ve really take a closeup look at since 2013. When you bring your own cup to Starbucks and use it for your beverage, you receive a 10 cent discount on your beverage. This hasn’t changed for years. Bringing in your own cup is a very earth-friendly thing to do, so please use your own cup! The personal cup discount is not offered when you are using for-here ware. The latest version clarifies what size cup you will be charged for. This is very helpful! Over the years, Starbucks has made same 10 ounce, 14 ounce, and 18 ounce tumblers and mugs. I believe the theory behind these cups of cups and tumblers is that it is an 8, 12, or 16 ounce drink with either 2 ounces of cream or a little walking room. Nonetheless, these odd sized tumblers create some confusion at the register. I’ve experienced it myself! Now you know, if you have a 14 ounce tumbler, you will be charged for a tall drink. You’ll never be charged for a size larger than your personal cup. Starbucks collectibles on display at Seattle’s MOHAI museum. Cute cup. Have you seen the reusable water bottles they sell for $4? Same shape and design as the new stainless ones (with loop around mouth, etc). Quite convenient and priced right. 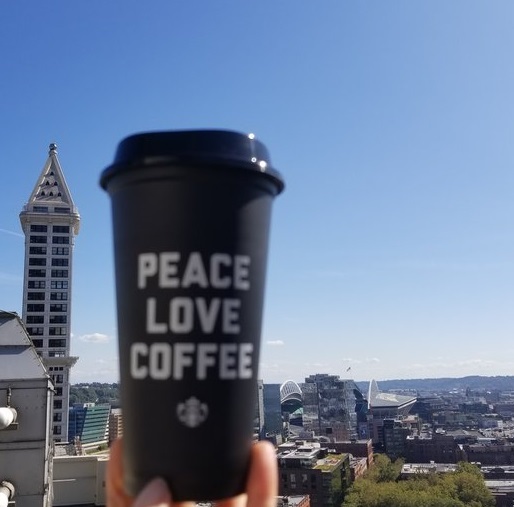 A 10 cent reusable cup discount is not a real incentive – it needs to be 25 cent or more to incentive people to be very earth-friendly. I think Starbucks should really make it more of an incentive for people to bring in their own cups–like $1 off–Starbucks I love you but you can afford that.Plus the inconvienance of lugging one all around all day. Where can I find one zip code 08816? 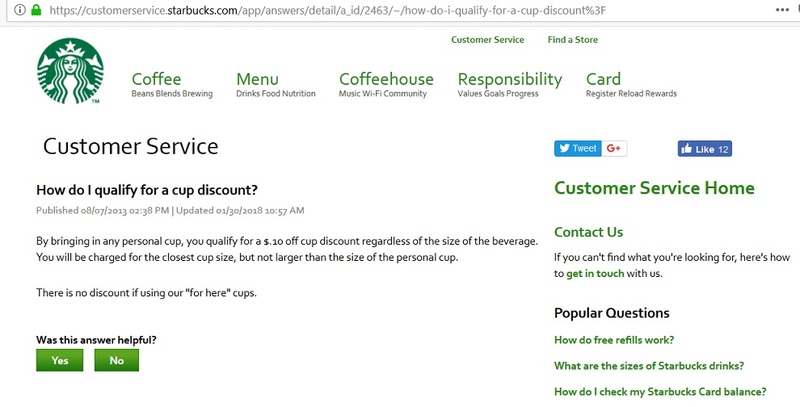 It may not be official policy to give the discount on for-here cup orders but, when I used to frequent Starbucks locations in California, I was probably given the discount 90% of the time. Never asked for it and I’ve never mentioned it when I didn’t get it but it does happen.